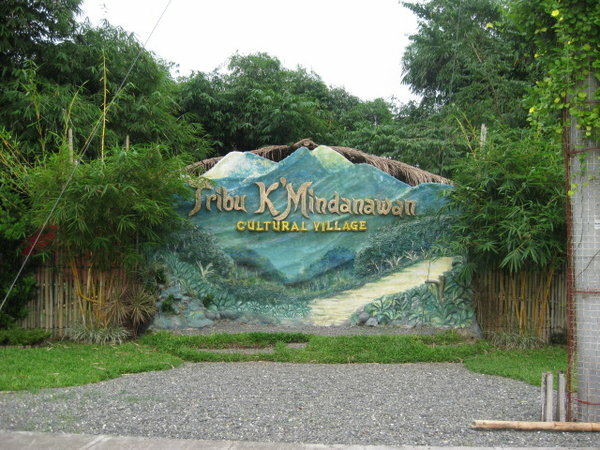 Tribu K’Mindanawan is a cultural village in Davao City that showcases the richness and diversity of the various cultures and colorful heritage of the different indigenous tribes of Mindanao. It is a widely popular attraction, frequented year-round by locals, domestic travelers, and foreign tourists, and is a must-see destination while in the city. The village consists of the cultural communities and tribes of the Mangguangan, Mansaka, Ata Manobo, Ata Paquibato, Obo Manobo, Bagobo Tagabawa, T’boli, B'laan, and the Mandaya, whose traditional houses, ornaments and tools are featured therein. The Mangguangan tribe is a close kin of the Dibabawon tribe that dominates the highland regions of New Corella in the province of Davao del Norte. 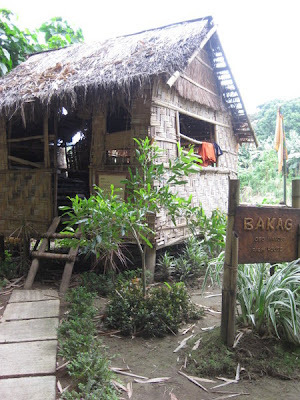 Their traditional house, called the Tog'gan, is made mostly of a lawaan bark - a light yellow to reddish-brown or brown wood, while the roof is made of rattan leaves lashed on bamboo laths supported by a set of kawit or sungag (finials) made of bagakay bamboo attached at the gable ends of the roof which are believed to ward-off evil spirits. The Tog'gan is usually elevated three feet above ground supported by sturdy round timber posts, and the walls are only about shoulder in height. At its door is a small altar called halaran, also believed to protect the household from evil spirits. An outdoor altar called inang is also installed in front of the house during house blessing. Centrally located inside the house is the abohan, or hearth, whose number depends on the number of wives the head of the household has, and on the sides are the sinabong or rooms which may have several partitions depending on the number of families consisting the household. 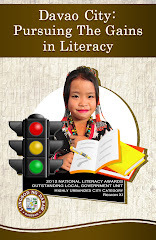 The Mansaka is the most prominent tribe that lives in dispersed settlements in the fertile valleys and hills of Compostella Valley Province whose economic and political life is largely guided by tribal elders known as Matikadong. The Baylan, or the village shamans perform rituals for the tribe, while the Bagani or tribal warriors protect the the rights and lives of the people. Their traditional house, called the Uyaanan, is typically is a single-room structure built on top of a tree, elevated some twelve feet above ground supported by sturdy timber posts. 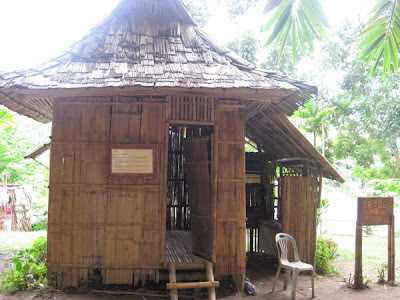 The house is usually made of bamboo, while the roof is made of sasal or bamboo shingles. A single log carved with notches or foothold serves as ladder to the house. Traditionally, the front of the house called, papaudan faces the morning sun. 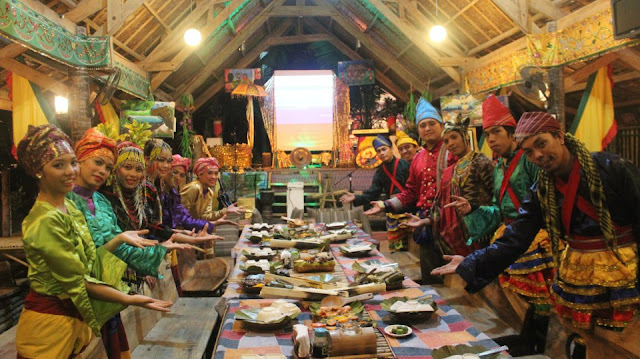 The house consists of the pilapil or their resting place, the tambi or the sleeping area, the pangabwanan where food is prepared and cooked, and the talaga where the kitchen utensils are stored. The Uyaanan are usually clustered in kinship-based neighborhood within sight of each other and may contain up to three family units. The selection of the site and construction of the house are directed by the Mansaka elders. The Ata Manobo is one of the three tribes that lives in the hinterlands of Talaingod in the province of Davao del Norte, who traditionally practice slash-and-burn cultivation. Their traditional house, called the Binotok, is typically constructed on top of hills or ridges adjacent to the fields and are usually far apart from each other. It is usually square in shape, and is constructed low, in some instances perched on top of a stump of a tree, with half-walls made of lawaan or langilan bark, while the roof is made of thick layers of cogon. The floor is made of bamboo laths lashed on round timber joists, supported by sturdy round timber poles raised high above ground with a single log ladder which is usually drawn up at night, while the space below is used mainly for storage where an outdoor altar called, the ankaw can also be found. In some instances, wooden rat guard discs are added on the posts of the house. Typically hung on the eaves of one corner of the house is a cage of a limakon bird whose song serves as a signal of good or unpleasant presentiments known as pangitain. Centrally located inside the house is the cooking area called, abuhanor, while alongside are raised platforms called, lantawan used for sitting and sleeping. Since the Ata Manobo believes in spirits that guard nature, no house is built without the shaman performing a ritual called panubag-tubag - a ceremony where the Baylan asks permission from the spirits whose answer, whether encouraging or not, usually comes in the form of a dream while the Baylan sleeps on the prospective site. Once the construction is completed, the altar used for the panubad-tubad is then transferred inside the house. The Ata Paquibato is a mixed negrito tribe that dwells in the upland district of Paquibato in Davao City, lead by a local chieftain called, Datu. Their ritual leader known as Temanerun is believed to possess a spirit guide commonly known as Abyan. Unlike the Lumads, their traditional house, called Binanwa Baluy, is built perpendicular to the east, or the sidlakan as it is popularly believed that facing the morning sun will bring misfortune upon the dwellers. The tribe believes in spirits borne from nature, and a house cannot be built without the Temanerun performing the rituals of panubad-tubad and the pamalas that seek guidance and permission from the spirits, where an offering is placed in a tambalan consisting of at least three altars built in front of the house. The house is usually elevated on stilts made of sturdy round timber posts and, in some instances, is perched on top of a stump of a tree as a defense against pangayaw or raid. The house is mostly constructed of lawaan bark lashed on a bamboo lath framing, while the floor is made of a bamboo laths. The roof is a bowed ridge beam of cogon grass braided on bamboo purlins where carved figures of a horse usually adorn the gable ends of the roof. Small windows on the side and rear walls serve as lookouts against potential spear-wielding attackers. The house can only be accessed through a single log ladder which is drawn up at night. Inside the house are elevated platforms known as lantawan which are built along the sides for sleeping and sitting while the area for cooking, called the abuan, is located in one side. While the Obo Manobo tribe is generally upland farmers, they also engage in hunting and fishing. The tribe dwells on steep slopes or ridges in the highland district of Marilog in Davao City, whose settlements are kin-oriented. Their traditional house, called Bakag, is an airy single-room structure perched on round timber posts elevated above ground, and can comfortably accommodate two to three families. It is usually constructed of salahiya or woven bamboo strips, girders, beams and roof frames of assorted round timbers, tied together with Uway or rattan strips, while the floor is made of bamboo laths. The roof is made of cogon and rattan leaves lashed on bamboo lath rafters. 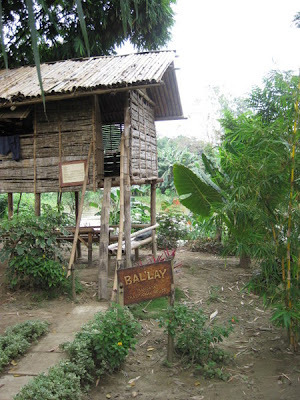 Built beside the house, about four to five feet above ground, is a small vault called lapong where the rice supply and the seeds for the next planting are stored. Inside the house is a wide and open multipurpose space where a raised platform alongside serves as sleeping and sitting areas. The window immediately above the platform ensures sufficient ventilation and a good view. The cooking area called the abuhan is located on the left side, and right above it is the paha - a wooden ledge where food is stored. The Obo Manobo believes in spirits guarding earthly objects. Hence, the tribe performs harvest rituals even before the gathering of construction materials to be used in building their houses. Once the construction started, another ritual called Komopittan Kos Morat Nod Toungtong is performed to appease the spirits that are believed to reside in the lot where the house was to be built. The ritual also involves pouring salt into the holes where the posts will be erected as protection from evil spirits. 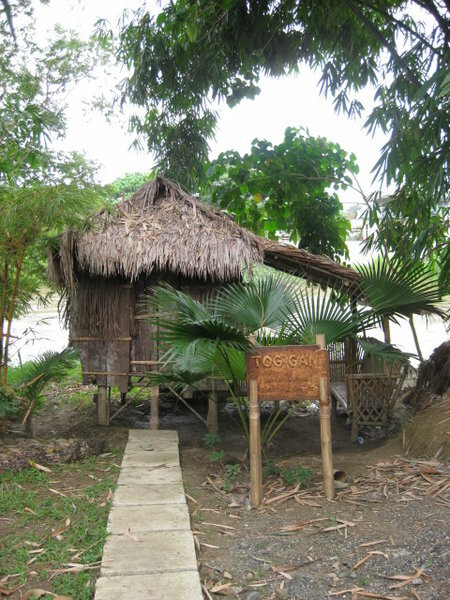 After the Bakag is finished, a tambala is then built in front of the house as part of the thanksgiving ritual called Kaha Ted Lape. The Bagobo Tagabawa tribe is one of the three subgroups of the Bagobo tribe that predominantly inhabits the vast tracks of land extending from the west coast of Davao Gulf up to the fertile hills and valleys at the foot of Mount Apo. The traditional house of the Bagobo Tagabawa of Tibolo, Sta. Cruz, called Bale, is made mostly of bamboo. The walls and the distinctively steep roof are all made of sinasa na kawayan or flattened bamboo. The floor and eaves are made of linapakan or bamboo laths, while the posts and beams are made of round timber. Their houses are typically built on top of hills, and are scattered near the fields. A typical Bale has an attic called andana that serves as an exclusive room for the daughters of the owner. The main floor is an open, multipurpose area with no partitions. In one corner, a hole is bore primarily for easy escape in case of danger. 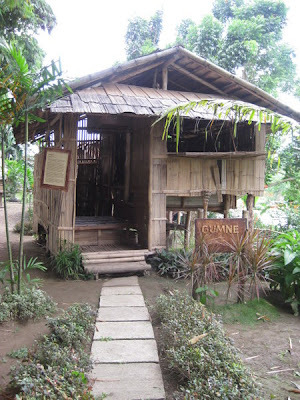 Unlike most Lumads, the abuhan or hearth is located outside the main living area. 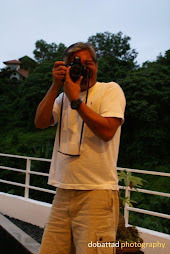 The Bagobo Tagabawa believes that the best time to build a house is during full moon. However, use of a bent or curved wood is considered a taboo; believed to bring misfortune or illness to the occupants. 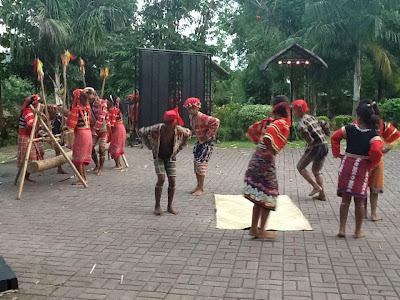 The T'boli tribe dwells on elevated terrains particularly around Lake Sebu, Lake Selutan, and Lake Lahit in South Cotabato in Southwestern Mindanao. The communities generally consist of several kin-oriented clusters with extended families common in households. 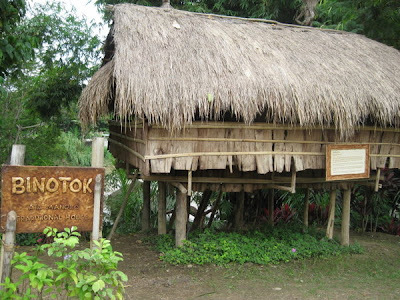 Their traditional house, called Gono, is built mostly of bamboo, cogon, and uway. The house is made of woven bamboo strips, elevated some three feet above ground, supported by bamboo poles, while the floor is made of bamboo lath. The roof is made of dried cogon grass intricately tied with bamboo laths. Uway, or rattan strips ties the components together. The size and complexity of the house is relative to the economic and social class of the dweller. The Datu, the head of the community, usually has the biggest Gono. Typically, the house is spacious where a raised platform called hoyuw are built alongside the house’s flanks mainly for sitting and sleeping. On the other side is the kohu where food is prepared and cooked. The windows or beng tenbo are wide and provide adequate light and ventilation, and also serve as ledges or extensions to the house. Traditionally, one enters a Gono through a trapdoor, but commonly used is a simple flush door made of bamboo. The B'Laan tribe dwells on the hills behind the western coast of Davao Gulf, extending up north to the Bagobo territory, and westward into the watersheds of Davao and Cotabato, including the cluster of Sarangani islands. Originally, the B'Laan were not highland dwellers. Their presence in the mountain is a result of later migration. Their traditional house, called Gumne, is the traditional multilevel home of B'Laan family from Datal Tampal, Malungon in Sarangani. A typical Gumne consists of six to seven platforms, built on four to five different levels. The first platform is the ba del which serves as a vestibule where rice are pounded and leads to the next platform called the ganas - the dining and living areas. The ganas leads to two other platforms: the lower platform, which is of the same level as the ba del, is the abo where food is prepared and cooked; while the upper platform called the Iwang is where important guests and visitors are received. Adjacent to the Iwang are two higher platforms called the snefil or bedroom where important belongings are kept. Both Iwang and snefil have wide hopper windows called tanbih sulong, which also serves as balconies during day time. The last platform is called the fantas, an attic where young women of the house sleep and are kept before marriage. The Gumne traditionally faces towards the east, as it is believed that the rising sun brings positive energy and good fortune to the household. Sugarcane stalks are tied on every front posts for happiness and peace, while stones are placed in front of the house to signify solidarity. The materials used in building the Gumne are relative to a family’s social status. Those belonging to the royal family use sinasa or flattened bamboo for their walls and roof, while those from the lower classes make use of wild sugarcane leaves. The latter usually transfer from one place to another in search of food and better living spaces. Because they often move out, the lower class B’Laans do not build permanent dwellings. The Mandaya tribe dwells along the mountain ranges of Davao Oriental, occupying upstream areas in highly dispersed settlements where they practice slash and burn cultivation. Their traditional house, called Bal'Lay, is rectangular in structure erected on stilts some five feet above ground and is usually occupied by two or three families. The walls are usually made of sayapo bar, securely tied in bamboo laths of uway or rattan strip in a zigzag pattern. The tips of the laths are carved with a distinct figure called the ligpit to prevent joints from slipping. 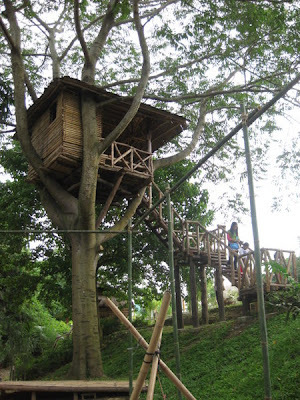 Posts and beams are all made of round timber, while the floor is made of sinasana kawayan or flattened bamboo. The stairs, called nuknukan are made of round timber, carved with distinctive foothold, while the handrails, called kal’lubabay, are installed afterward. 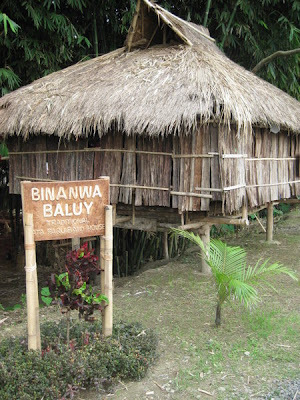 A Bal'Lay with a distinctive split bamboo roof is commonly called a lyupakan. 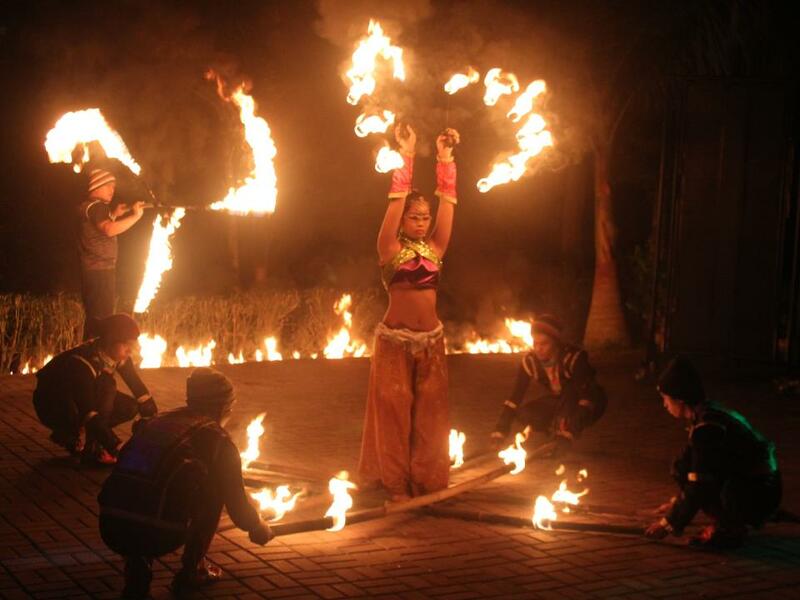 Aside from the foregoing indigenous structures and communities, Tribu K’Mindanawan also regularly features cultural performances highlighted with an amazing display of fireshow every weekend on Fridays, Saturdays and Sundays, from 5:45 PM to 6:30 PM. The show features the various traditional dances of Mindanao like Singkil, a famous Maranao dance. To cap the day's events, guests and visitors to Tribu K’Mindanawan will surely enjoy and experience the richness of truly Mindanawan-inspired cuisines and delicacies only at the Kaonanan. Tribu K'Mindanawan is located inside the Davao Riverfront Corporate City along Ma-a Diversion Highway in Davao City. It is about 15 minutes drive from downtown, and is easily accessible by all types of transportation.